I often say that writing a book is the nerd equivalent to running a marathon. I’ve done both of those things, I can with complete honesty and accuracy say that it is completely and 100% true. While writing a novel and spending hours running endless miles is a solitary activity, there’s a lot of support from other people that makes these feats much easier to accomplish. When I trained for my marathon, there was a day on my training schedule where I’d have to run 20 miles. The entire race is 26.2 miles. That .2 is a big deal when you’ve already run 26, believe me! I planned my route so that I’d have to run into Connecticut; the state line is a few miles from my house. I figured if I were running 20 miles I should have to run to a different state. I jotted down my route and left it at home with Todd. He was planning on meeting up with me half way through to make sure I was OK, as I’d be running the desolate back roads of Western RI and Eastern CT. He pulled up beside me, handed me a cold water and a banana. Then he did the coolest thing a marathon husband could do. He blasted Eye of the Tiger by Survivor as he drove off. There have been a number of people who have supported me through the marathon of writing Beside the Music and my next one Before the Music. And I wanted to give a few of a shout out here. Todd. Of course. I will never for as long as I live forget that fancy dinner we had on Shelter Island on vacation years ago where we bounced around plot ideas for Beside the Music. You are always the loudest one in my cheering section. When you came to my reading that night I watched you beam and how hard your hands applauded for me. I literally would not be able to do this without you. Melissa. My sister in law. The very first person to buy a copy of Beside the Music. How cool is that? You were the FIRST! That says so much and means so much to me. Brian. In the top 3 of coolest people I have ever met. That Brian. The second person to buy a copy of Beside the Music. Also, the one who says he could hear my voice in Brenda’s. I am sorry Hydra’s not a real band, and I love that you forget and look for them in iTunes. Sean. Badass scuba instructor Sean. The one who says “But why would that even work in a story?” Thanks for helping me keep it real. Margaret. My older sister. The one who says things like “It takes years to become an overnight success” when she can tell I am getting frustrated. All the friends who cheered me on, who asked about the book, who wrote reviews: Allie, Tyler, Nikki, Shawn, Gail, Lincoln…. So many people! And so amazing! And now for the OMG-I-am-so-overwhelmed-she-did-this moment of the blog entry. My mother in law, Tina, who is nothing like Brenda’s mother in law Portia. (You hear me? NOTHING like her.) You bought me a book about finding an agent. You bought me one of those squeezy plastic bottles with the sponge at the top for sealing envelopes when I send out manuscripts. But the thing you did recently was so completely over the top that my mouth hangs open every single time I look at it. My mother in law is a very talented painter. But this one just went beyond my wildest dreams. 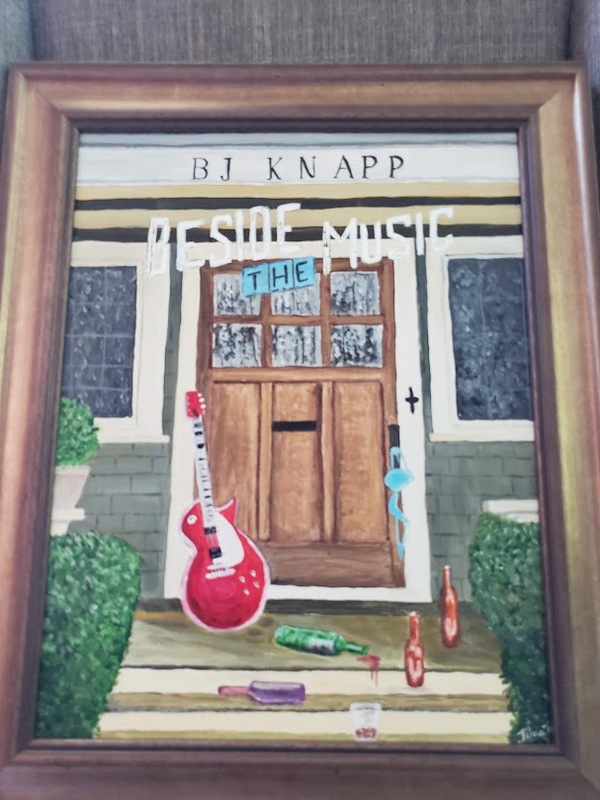 I keep forgetting to frame a copy of Beside the Music to commemorate the work that went into publishing it. And now I don’t have to. Here it is, painted by the great Tina Knapp.